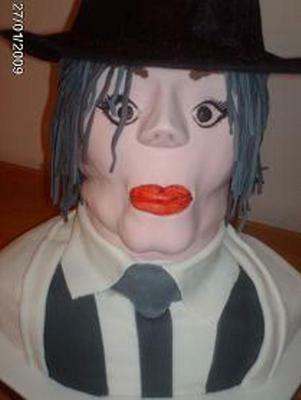 This Michael Jackson cake is made of a chocolate madeira and it was carved whilst partially frozen. The board is covered in sugarpaste. The first layer is buttercream iced with a thin layer of vanilla buttercream , the neck is carved and placed onto the shoulders and buttercream iced. The head is baked in a round pan and sandwiched together with buttercream, it is carved into a scull with hollows for the eyes whilst semi frozen and placed onto the neck. A wooden dowling is inserted through the head, neck and shoulders. It helps to place a number of small sugarpaste or pastiallage discs around the dowling between the neck and the head to further support the head in place and prevent sagging. The entire head is buttercream iced with a thin layer of vanilla buttercream. This is then left to crust. The eyes are made of round balls of white sugarpaste and painted on irises and left to dry. The nose is constructed using paste to build and shape it as is the mouth and any other features, such as the chin and cheekbones and eyebrows. The eyeballs are glued into place with royal icing. The entire head is then covered with flesh coloured sugarpaste, forming it carefully with your hands around the features to resemble Michael. The eye areas are cut away to reveal the eyes and formed around the eyes into eyelids. The makeup is painted onto the face. The white shirt, collar and tie are pasted onto the cake and glued into place with cmc and gin mixed together to form a glue. The jacket is then made from sugarpaste and placed around the shoulders. Finally the black sugarpaste hair is made by pushing the paste through a spaghetti / pasta machine and glued into place all over the head with the cmc glue. The hat is formed from sugarpaste and placed onto the head once the hair has dried. The hair and hat is overpainted with black to prevent fading out to grey after it has dried. Voila - Michael Jackson! Congratulations! You really got the right face expression on this cake, if it that face, neck and shoulders would have been carved a little narrower...it would have been a total replica of his face...Very Good! Thank you Nancy and Kelly.